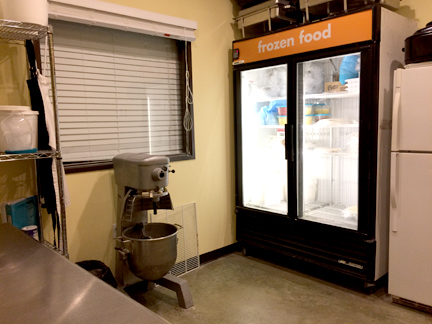 Texas Talking Pies has been busy in the kitchen making the most of our space! Each batch of our Custom Pie dough starts by hand with fresh, quality ingredients. 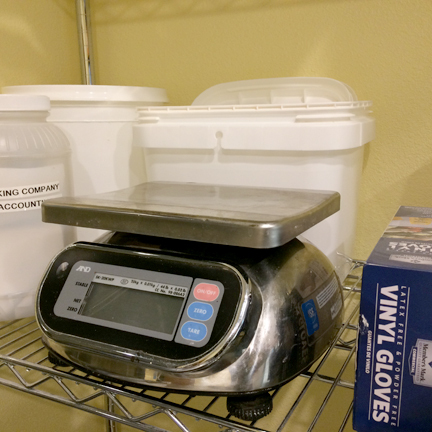 Our kitchen scale comes in handy from beginning to end of the process. A spacious work surface is essential for our master chef, Donnie, to make the crust magic happen. The containers you see below the shelves are great for storing large quantities of flour, pastry flour, and sugar - the starting point of every delicious pie. Our freezer is essential for keeping your personalized crusts fresh while they wait to be baked. Once the pies come out of the oven, they are not frozen again - we ship directly to you to preserve the flaky freshness in each bite! Your pie will last a week or more on the counter without freezing, but can be frozen for many months longer if you have the willpower. The "Big Boy" mixer, though unassuming, is the secret to getting an even consistency in every filling. Our pecan pie filling is my favorite to make. The scent of fresh Texas Pecans combined with sugar and liquid vanilla is a treat in itself! While each of our pies is certainly crafted by hand, our equipment makes the whole process run smoothly and efficiently! These are the tools that make it as feasible to handcraft 1000 custom pies for your clients at the holidays, a table of personalized hand pies to sweeten up your event, and a very special one for grandpa's 70th birthday celebration. Contact us at txtalkingpies.com/contact to share your ideas, and follow us on social media for more custom pie updates. Wondering what's inside your Custom Pie?